Lu Yushun, a contemporary painter of modern ink-wash paintings, is also a member of the Chinese Artists’ Association. Lu Yushun is best known for striking red landscapes, painted on large, hanging scrolls along a distinctive central axis, often set against a black background that demonstrates an extremely sophisticate use of the ink. Lu graduated from Harbin Teachers’ College in 1983, and then pursued graduate studies in the Ink-painting Department at the Central Academy of Fine Arts in Beijing. In 1996, he was appointed Dean of the Fine Arts Faculty at Harbin Teachers’ College, and became the chairman of Heilongjiang Province Artists’ Association. His landscapes are also painted on album leaves and fans, and are inspired by poetic verses. His compositions do not consider perspective; the likenesses of objects are deliberately crude. The glacial aloofness of his compositions displays an awareness of patterning practices and familiarity with Western abstract art. 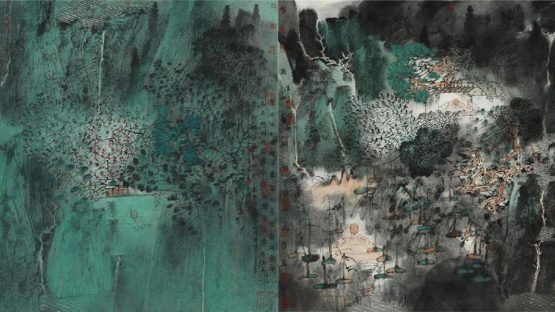 Lu Yushun has participated in the annual exhibitions of New Literati Painting since 1989, and in 1993–4 he attended a special graduate seminar that was organized for the adherents of this movement. He received awards from the 1st International Ink-painting Exhibition in Beijing (1988) and from the 8th National Art Exhibition, and has participated in numerous other art exhibitions, at home and abroad, especially in those Asian countries which have been traditionally linked to Chinese culture.